Karen: Welcome to Episode 2 of The HealthTimes podcast. I'm your host, Karen Keast. Today, we're speaking with registered nurse Ruth Fazakerley, who is working with the Australian Medical Headquarters Team, to support the Australian Olympic Team at the Rio Games. Ruth is the only registered nurse in the Medical Headquarters Team, which also includes seven physiotherapists, eight soft-tissue therapists, three nutritionists, two psychologists, and six doctors, including five sports medicine specialists and a general practitioner. Ruth, thanks for speaking to us, all the way from Rio. You were part of the Australian Paralympic Team for London in 2012, but this is your first Olympics. What has your experience been like? Ruth: It's been such a unique experience. It's been amazing; I've loved every minute of it, even though I'm feeling really tired now, as we're coming to the end of the campaign. I just feel so privileged to be here, with all these athletes, and to be a part of such a fantastic medical group. I'm so lucky to be here, and I've loved every minute of it. Karen: What does your role involve at Rio, and what range of injuries have you been treating? Ruth: My role: there's three components to my role. I was involved through the AIS, and my contact with the Chief Medical Officer there, in the preparation of the athletes, with the vaccination program. Then, here, it's mainly a role very similar to a clinical practice nurse. Then, when we go home, it will be part of a review process, and documentation. But the role, actually while we're here, each day the clinic runs from 7:30 in the morning, to 10 at night. Most of the time, I'm there. As I said, it's a clinical role, so I'm looking after the management and the dispensing of medications, assisting the doctors with any procedures, and also, my real focus is wound management, and looking after infection control - any infectious problems we have with the athletes, managing the process of their isolation, so we can protect the other team members. That's basically the overview of what I'm doing here. Karen: Ok. So what have been some of the challenges of your work in Rio? Ruth: Rio's presented a lot of challenges with just the environment we're working in. We always knew that mosquito-borne disease, and infections with the pollution in the water, were going to be an issue, but we've also come across additional problems with the environment the athletes are living in, and the daily cleaning. We've had to really change our focus towards keeping them healthy while they're in the village, and not only when they're out there, competing. Karen: Have you had many infections? Ruth: We have. It's been manageable, and I think that's because of all the education we've given to athletes on how to stay healthy and protect themselves, but even so, we've come up against some gastroenteritis, and a lot of others respiratory tract infections. Nothing that's been overwhelming, and it's been manageable, but it's also been consuming in my role. Karen: What have been some of the highlights of your role? Karen: Are there any examples of that, that you can share with us? Ruth: Without revealing too much, an athlete who had to compete, she had to get out and compete, she was an archer, and she had to shoot... She was collapsed on the floor for a night, and we had to take her to the polyclinic. She had to be rehydrated, I didn't think she was going anywhere, and within 24 hours, we had her just standing there, shooting some arrows. Then she had another couple of days rest, and she went on to... That was really quite satisfying. Karen: What's it like to work with our elite athletes at the world's premiere sporting event? They must be feeling a complete range of emotions! Ruth: Yes, they do, and I think, as a team, with our team leaders, we've been made very aware of the different times athletes are feeling different things. When the athletes come into the village, they're so excited: they've achieved their goal, they're here, they're ready to go. Then there's the anxiety pre-event, particularly those athletes who have suffered an injury or been unwell, and they're not really getting at their peak, when they're actually going to compete, so there's some anxiety. Then there are ones who are really just totally elated because they've got a gold medal, and then there's other athletes, and we're seeing all of these athletes, because we see athletes from a lot of different teams. Then we see the athletes who have actually dropped out in team sports, haven't actually made it through to quarter finals, and just the disappointment and the sadness in those athletes. So it's been really... You see the whole range: there's lots of ups and lots of downs, but I think, as a medical practitioner and a nurse practitioner, we have to be very aware of where that particular athlete is, in the scheme of things, and respond to them the best way possible. Karen: Have you also had the opportunity to take in any of the sights of Olympic events? Ruth: Well, yesterday I went up to the very famous tour, the ‘Christ the Redeemer’, so that was my first venture out, and that was just wonderful. That was amazing, we had the best day, it was sunny, it was hot. Fantastic photos of me in front of Christ the Redeemer, and the view of Rio... We actually hear, and you hear about all the different venues, but you're able to get to that lookout, and see where they're all placed. The venues in Rio are just incredible settings; they are really magnificent. Also, I've been to see, I'm a real basketball fan, and I went, I was thrilled, to go and see the Australian men's team play the USA team. Even though we lost, it was one of the best performances by an Australian team. So that was really good fun. I've also been to the swimming. So it's good; I do get out a bit. Karen: That's great! You've done well. Karen: So how does this experience compare to your experience as part of the Australian Paralympic Medical Team for London, four years ago? Ruth: The actual work is very similar, even though in London, with the Paralympians, and the athletes here, it's all very similar work. Both Paralympic athletes and Olympic athletes are highly focused, independent, athletes with very similar problems. That's been really much the same in my work focus, but the main difference has been the organisation. London was a very easy Olympics to be in the medical team; the polyclinic set-up, and just the transport, and no language barrier, and they were highly organised and very efficient. So it was a very easy games. This games, I feel quite sorry for the Brazilian people; they're having a lot of struggle with their political issues, with violence, with crime and poverty, and they've done a magnificent job to put this on, but the standards here are quite different, and there's a lot more obstacles to overcome, to give our athletes the same sort of care that we want to give. That's been the major difference. Karen: Have you felt safe, during your time in Rio? Ruth: We have a very good security team, who give us lots of advice, we get lots of alerts. You can't deny there are hold-ups and crime out there, but if you follow their rules, and take the proper transport, and if we follow their guidelines, I felt safe. There are lots of things about things that people have taken a risk, and it's turned bad. I particularly have been, but it's made me not do things on my own: I've gone with larger groups, and guided tours, and things like that. It makes you want to stay safe. Karen: How do you get to be a nurse working with the Australian Olympic Team, at an Olympic games? Can you tell us about your nursing career, and how it lead to this moment? Ruth: Well, I actually trained in Melbourne, and I moved to Canberra with my husband. When I moved here, I worked at the Royal Canberra Hospital. Then I had my daughters, and when we had children, shift work didn't suit me, so I trained to be a sexual health nurse practitioner, and I did clinic work. So I did six clinic sessions while the children were young, and then when they went to school, I lived ten minutes from the AIS, and I noticed there was a job. It was just before the Sydney Olympics, and they had a lot more money in sport, and they had what they called an 'Olympic Athlete Program', so there was huge funding to provide the best to our athletes in Sydney. Of course, they employed a lot more staff at the AIS, to do this, and one of the roles was an extra nurse, to work with the full-time nurse there, at the AIS. I managed to get that position, and I only did part-time, up until Sydney. Post-Sydney, there was an opportunity to work full-time, and I had the best experience at the AIS prior to Sydney, and I just thought, 'This is the dream job.' Even though I wasn't ready to go to full-time work, there was no way I was going to give up that opportunity. It's a fantastic place to work. Then, just through the contact of working with people who actually... I've prepared five teams, five Olympics, now, and just getting teams ready, helping with vaccinations, and then, I guess, just knowing the people, and being there, and having the contact with the medical directors, I was given the opportunity to go to London and to come here. Karen: I understand you pretty much singlehandedly managed the Rio vaccination program for the Australian Olympic Team, of more than 850 people, in the lead-up to the Rio Games. How much work goes into preparing the athletes, the support team, and officials, for an Olympic games? Ruth: Well, I can't really take all the credit for the vaccination program, but we did do a lot of vaccinations. This Olympic team is the most vaccinated Olympic team in history, I think. Beijing, there was a lot of vaccinations, London, almost none. But this… with the yellow fever, and also, we tried to prevent travellers’ diarrhoea, so the team were vaccinated with dukoral, which is a cholera vaccine, but it also has an added benefit of preventing traveller’s diarrhoea. So the logistics of actually vaccinating that many people all around Australia, and some of them overseas, was huge. The AOC provided all the vaccines, and we actually just coordinated a lot of the teams that came through the AIS. 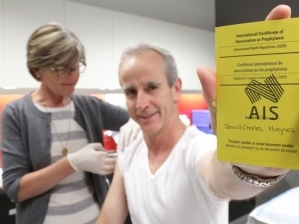 Of course, not everyone could get to Canberra, so there were other people vaccinating, and that's the institutes in the states, and also if they couldn't get to the institutes, like the NSW Institute, or VIS, the Victorian Institute of Sport, athletes we actually overflowed to travel vaccination centres. So there were a lot of people involved, but nearly everyone that went through the AIS was vaccinated by myself and another nurse. We actually, one day, the swim team, the whole Australian swim team, were in town. They had a camp where they were acclimatising to Rio times, and swimming times, and they gave us two hours to vaccinate the whole team, because they were on a timetable. That was a mammoth effort: it took two doctors, two nurses, and a whole group of other people, but we managed to vaccinate about 44 people with probably 14 vaccines each. So that was an amazing day, and I think it was a PB. Karen: I like that! Do you have any advice for other nurses interested in working in this field? Ruth: Well, I'm not aware of any pathways. This just sort of eventuated for me, but I would recommend, if anyone's really interested, in trying to get to the Olympics, would be just a few things if you're interested in that type of nursing, working within a sports medicine practice. Also, Sports Medicine Australia offer fantastic First Aid courses and Sports First Aid, and they can put you in contact with sporting clubs that are grassroots level, and also work up towards a national sporting organisation, being involved in their First Aid management. Also, I think, putting yourself forward, and maybe doing, in the lead up to the Olympic Games, sending an expression of interest to the AOC, to just let them know you're out there, what you've been doing, and that you're really interested in this sort of work, if there are any jobs available. Karen: What will the rest of your time in Rio involve, and what will you do after the Olympics? Ruth: We're on a downhill stretch now, which is really hard to believe, because there's so much preparation, then you get here, and then it's really exciting. Now a lot of the events have finished, but we've got to stay really upbeat, and really focused, and still giving the same medical attention to these athletes that are just starting their games. Even though, in our minds, we're thinking, 'Ok, we're getting towards the end', we have to stay really focused, and help these athletes, and treat them just as well as we treated those athletes at the beginning. It's still the same, I'm hoping that athletes, the ones that have finished their competition, a lot of the focus, now, is actually encouraging them to stay healthy, to protect their teammates that are still competing. Then, I guess, right towards the end is packing up, and looking after the athletes on their way home. I think, for myself, after this, I'm going to have a little break in November. In November I catch up with some of the nurses; we have a reunion. So I'm hoping to catch up with them for a week, and tell them all about this experience, and then hopefully, next year, do some travelling overseas. Karen: Do you hope to also support Aussie athletes, as a registered nurse, at the 2020 Olympics in Tokyo? Ruth: I think Tokyo will be fantastic. I think it will be so well organised, I think it will be an amazing experience. But I think this is such a unique experience, and so few people can do it. I think it's time for someone else to have a go! I think it's something to be shared around amongst nurses, there aren't too many opportunities, and I think someone else should have a go. Karen: Fair enough. What is the one thing you'll take away with you from your Olympics experience in Rio? Ruth: It's been so positive, despite all the hurdles, we thought Zika... Every time you thought you heard something about Rio, leading into Rio, it was just another thing, we have to deal with. Even getting here, there's been lots of hurdles, but was has been really important, for me, is that nothing's let us done, nothing's overcome us. We've really taken every hurdle and made it a positive, and being part of that amazing team, with that focus and that attitude, and the support for each other, has been really wonderful. 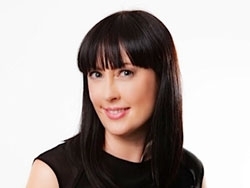 Karen: Ruth Fazakerley, thanks for your time, and thanks for listening to the second episode of The HealthTimes podcast. We'll be back with more podcasts. You can subscribe to The HealthTimes podcast on iTunes, and don't forget to check out the range of jobs, articles, and other resources on The HealthTimes website, by visiting healthtimes.com.au.